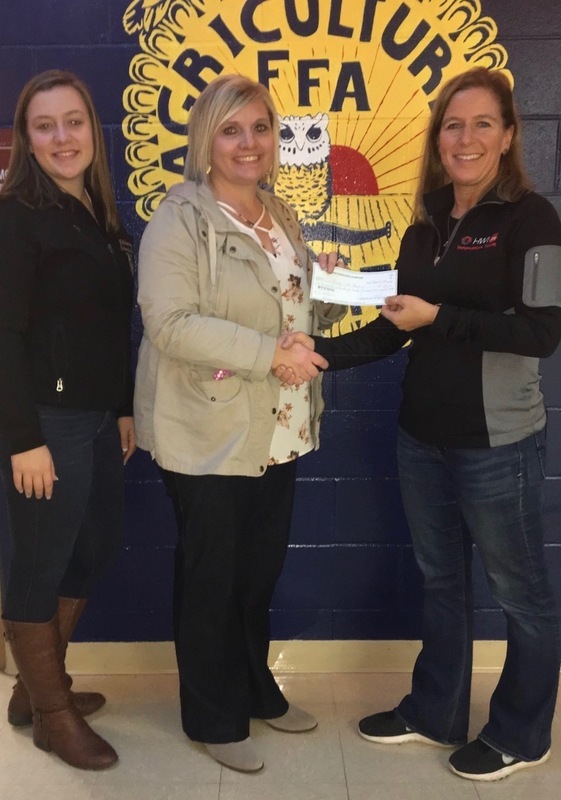 On October 16, 2018, the HarbisonWalker International (HWI) Foundation donated $1,625 to the Felicity-Franklin FFA Alumni and Supporters. Each year, the HWI Foundation canvasses employees for donation suggestions. Laura Lowe, member of the Felicity-Franklin FFA Alumni and Supporters and mother of two FFA members, nominated the Felicity-Franklin FFA Alumni and Supporters for the donation. The Foundation selected the Felicity-Franklin FFA Alumni based on Laura Lowe’s recommendation and after receiving the donation, Laura Lowe presented it to the chapter. The Felicity-Franklin Alumni and Supporters sponsored the t-shirts for the 75 members attending National FFA Convention in October to highlight the chapter’s accomplishments. The Alumni also uses funding to provide scholarships, cover convention fees, hotel fees from Ohio FFA Convention, and sponsor fair awards. Caption: On the left, Felicity-Franklin FFA President Bailey Lowe and in the middle, Felicity-Franklin FFA Advisor Holly Jennings, receive the $1,625 check from HarbisonWalker International employee Laura Lowe.